2 Bedroom Flat Above An Award Winning Cafe. Cardinham woods is a 600 acre forestry commission woodland and you will be staying at the very heart of this beautiful valley and all that it has to offer. With miles of way marked walking trails, a kids play park, BBQ pits and the infamous Bodmin Beast mountain bike trail there is plenty to see and do to get you and your family outdoors. Bodmin town is only 5 mins drive and offers supermarkets, banks and most high street requirements. Bodmin is very central in Cornwall and as such you are only 30 minutes form either the North or South Coast of Cornwall and can drive to Eden in about 25 mins. A perfect location to truly explore Cornwall in the knowledge that the evening quiet of the woods awaits on your return. Although we welcome children of any age please note that there are a number of outside concrete steps to reach the front door of the property so toddlers will probably need escorting! We have a check out time of 10am and a check in time after 2.30pm. We charge £5 per person per night over 4 people. Lara and David are Cornish born and bred and in fact David grew up a few miles up the valley on Bodmin moor to a sheep farming family. We have a young family and love running our little cafe in the woods. We have run the award winning Woods Cafe since 2009 and lived above it in this flat until December 2014 when we finally managed to buy our own home. We thought people might really enjoy staying in this haven in the middle of Cornwall. The flat is lovely and cosy and the woods are amazing with all the changing seasons and the changing times of day. One of my personal favourite things are the rooks and crows coming in to roost in the evenings during the winter months. We have run the award winning Woods Cafe for 8 years and lived above it in this lovely little flat until December 2014 when we finally managed to buy our own home. We thought people might really enjoy staying in this lovely little haven in the middle of Cornwall. The flat is lovely and cosy and the woods are amazing with all the changing seasons and the changing times of day. One of my personal favourite things are the rooks and crows coming in to roost in the evenings during the winter months. We have a clothes horse. We will get you started with tea, coffee, milk and bread. You should have everything you need! Small dining area in living space. We have a few books and some board games. Big garden in a lovely wooded area. The mountain biking is really good with red and blue grade single track right outside the flat door. Lanhydrock golf course is 5 mins drive. Notes on accommodation: Kids are more than welcome but please be aware there are some steps outside that you will probably want to accompany toddlers on! Beautiful woods to explore on foot and bike. Fantastic cream teas on tap. Owners and staff in cafe helpful for all needs. Perfect. Really glad you enjoyed your stay again. Really look forward to seeing back again next year! The apartment has everything you need including comfy beds, a powerful shower and lots of fluffy towels and the team in the cafe downstairs are on hand and make you feel very welcome. We had a problem with the oven and it was replaced the next day. Getting the woods and the play area to yourselves early morning and evening is really magical and we kept popping outside to listen to the night time noises, the owls sounded amazing! August, the early mornings could be a bit cool. For these 2 reasons we've given 4 stars not 5. We will be back as soon as we can! David and Lara and their staff are very welcoming, friendly and helpful. Forestry staff very friendly and helpful too. Love the flat... it's just perfect for us. Delicious food in the cafe downstairs. Loads of walks from the door. Lots of safe places for dogs and children to play in the rivers and streams. Lovely play area for children. Already looking forward to our next visit in the autumn. Cosy, warm and homely flat. Lovely spot, great cafe and friendly people. Kids enjoyed the freedom of playing in the playground, the woods and cycling. Our family really enjoyed the week in Cardinham Woods. The flat had everything we needed and is well situated. We visited many places including Bodmin Jail, Geevor Tin Mine, Eden Project and Lost Gardens of Heligan and had many walks in the woods with the children and dog. The children spent a day at Badger Forest School and we even visited friends in Devon. There was no TV so we were able to spend quality time together in the evenings playing games, which we wouldn't usually do! 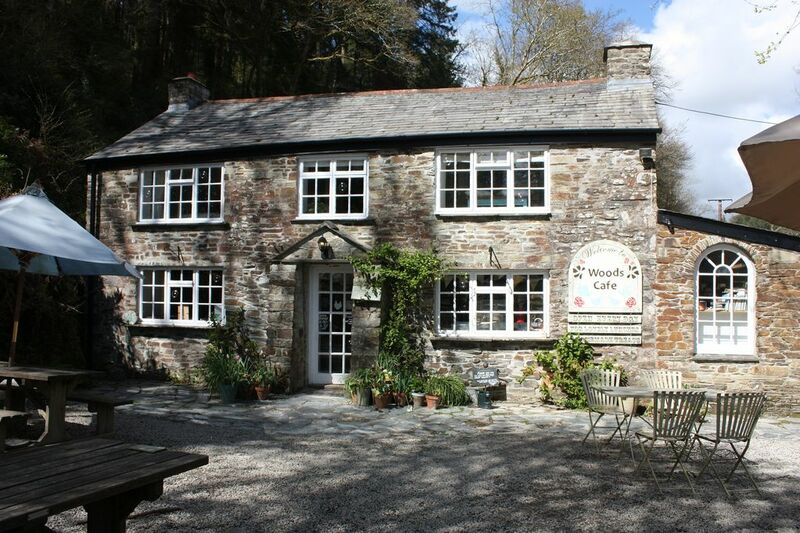 Woods Cafe treated us to an amazing Cornish cream tea and the owners were lovely. Would recommend and visit again. Thank you very much. Booking Notes: Booking secured with 25% deposit and final payment 7 days prior to arrival. Changeover Day: Friday is our changeover day although it always best to ask if this does not suit, we may be able to arrange alternative days if needed.